Aerial view from East, dated c. 1917. 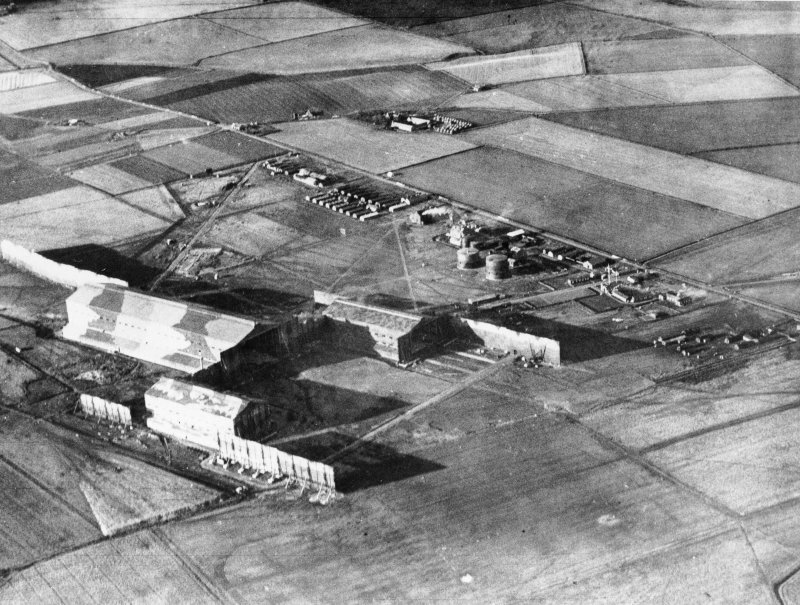 Longside military airship station, also known as Lenabo after the nearby farm, was established in 1915 as a base for airships to patrol the North Sea, where German submarines posed a threat to Allied convoys. The station, at over 400 hectares (measuring 3 km by 2.13 km), was the second-largest in Scotland. The station was built by the Aberdeen contractor, Tawse. The establishment of the station in the later part of 1918 was 864, of whom 82 were women. The accommodation for the station was grouped at the northern edge of the site, next to the public road that bounded it. There were three airship sheds a short distance to the SE: the largest was a Rigid Airship Shed measuring 216m by 45m and 32m high. The two smaller coastal airship sheds measured 98m by 34m and 24m high. The coastal sheds cost £60,000 (£5.1M at 2013 prices) and were ready for use in November 1916, while the rigid shed was finished in March 1917. The technical buildings included a gas plant and workshops and lay on the northern boundary of the site, east of the accommodation. A railway branch line was built from the main line to serve the air station. The airship station closed in 1920 and most of the buildings were demolished. The ground plans of the three airship sheds show as unplanted clearings in the modern forestry plantation and fragments of concrete are visible in the area. Although there is no trace of it today, there was an airship patrol station here from 1916 to 1918. In 1917 a sub-station was established at Auldbar [Aldbar: NO55NE 40], four miles NW of Montrose. Longside airship station was established in 1915-16 as a major element of the strategic network protecting the British coastline, and, as such, was intended the accommodate the larger 'Coastal' or 'North Sea' types of non-rigid craft as well as those of the embryo rigid fleet. Accommodation at such stations typically comprised a rigid-airship shed flanked on each side by a smaller 'coastal' shed, these being stepped forward forward to afford a sheltered area in front of the rigid shed. The assemblage was aligned with the direction of the prevailing wind. The rigid shed at Longside measured 150ft 6ins (45.87m) in width, so as to be able to house two of the earlier 23-class rigids. Remains of airship station. Air photographs: AAS/97/04/G8/23-4 and AAS/97/04/CT. National Archive documents (AIR 1/453/15/312/26 vol VI) show the exact location of both the domestic site, immediately S of the public road from Newton to Auchtydore about 630m NE of Olrig Croft. The three airship hangars were at NK0298 4256, NK 0302 4272 and NK 0318 4258, now within the coniferous plantation to the S and SE of Easterton of Lenabo. The current OS 1:2500 scale digital map shows three rectangular gaps in the trees which correspond to the site of the airship hangars. In addition to the surviving foundations of the airship hanger, vertical aerial photography (next perspective orthorectified aerial imaginary) shows a number other features, including roads, building foundations (e.g. NK 02944 43151) and site of the former gas holders at NK 02851 42822 and NK 02886 42847. The area has been planted with trees but it would seem possible that many of the building foundations of the airship station are still present. Information from RCAHMS (AKK) 3 June 2013.